Definition at line 113 of file lllocalidhashmap.h. Definition at line 163 of file lllocalidhashmap.h. References i, MAX_ITERS, LLLocalIDHashMap< DATA_TYPE, SIZE >::mIters, NULL, and S32. Definition at line 175 of file lllocalidhashmap.h. Definition at line 187 of file lllocalidhashmap.h. References i, MAX_ITERS, LLLocalIDHashMapIter< DATA_TYPE, SIZE >::mHashMapp, LLLocalIDHashMap< DATA_TYPE, SIZE >::mIterCount, LLLocalIDHashMap< DATA_TYPE, SIZE >::mIters, NULL, LLLocalIDHashMap< DATA_TYPE, SIZE >::removeAll(), and S32. Definition at line 707 of file lllocalidhashmap.h. References i, llendl, llerrs, MAX_ITERS, LLLocalIDHashMap< DATA_TYPE, SIZE >::mIterCount, LLLocalIDHashMap< DATA_TYPE, SIZE >::mIters, NULL, and S32. Definition at line 334 of file lllocalidhashmap.h. References count, i, LLLocalIDHashNode< DATA, SIZE >::mCount, LLLocalIDHashNode< DATA, SIZE >::mKey, LLLocalIDHashNode< DATA, SIZE >::mNextNodep, LLLocalIDHashMap< DATA_TYPE, SIZE >::mNodes, S32, and TRUE. Definition at line 262 of file lllocalidhashmap.h. References i, LLLocalIDHashNode< DATA, SIZE >::mCount, LLLocalIDHashNode< DATA, SIZE >::mData, LLLocalIDHashNode< DATA, SIZE >::mNextNodep, LLLocalIDHashMap< DATA_TYPE, SIZE >::mNodes, and S32. Definition at line 242 of file lllocalidhashmap.h. References i, llendl, llinfos, MAX_ITERS, LLLocalIDHashMapIter< DATA_TYPE, SIZE >::mCurHashNodeKey, LLLocalIDHashMapIter< DATA_TYPE, SIZE >::mCurHashNodep, LLLocalIDHashMap< DATA_TYPE, SIZE >::mIterCount, LLLocalIDHashMap< DATA_TYPE, SIZE >::mIters, and S32. Definition at line 306 of file lllocalidhashmap.h. References count, i, LLLocalIDHashNode< DATA, SIZE >::mCount, LLLocalIDHashNode< DATA, SIZE >::mData, LLLocalIDHashNode< DATA, SIZE >::mKey, LLLocalIDHashNode< DATA, SIZE >::mNextNodep, LLLocalIDHashMap< DATA_TYPE, SIZE >::mNodes, and S32. Definition at line 289 of file lllocalidhashmap.h. 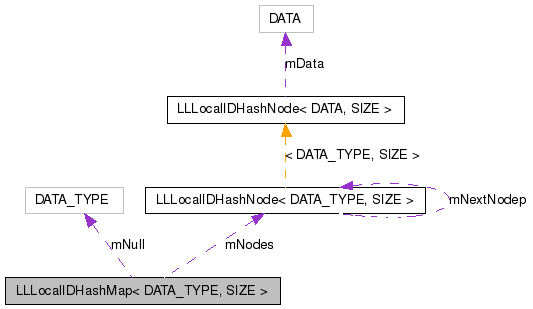 References count, LLLocalIDHashNode< DATA, SIZE >::mCount, LLLocalIDHashMap< DATA_TYPE, SIZE >::mNodes, and S32. Definition at line 418 of file lllocalidhashmap.h. References count, FALSE, i, MAX_ITERS, LLLocalIDHashNode< DATA, SIZE >::mCount, LLLocalIDHashMapIter< DATA_TYPE, SIZE >::mCurHashMapNodeNum, LLLocalIDHashMapIter< DATA_TYPE, SIZE >::mCurHashNodeKey, LLLocalIDHashMapIter< DATA_TYPE, SIZE >::mCurHashNodep, LLLocalIDHashNode< DATA, SIZE >::mData, LLLocalIDHashMap< DATA_TYPE, SIZE >::mIterCount, LLLocalIDHashMap< DATA_TYPE, SIZE >::mIters, LLLocalIDHashNode< DATA, SIZE >::mKey, LLLocalIDHashNode< DATA, SIZE >::mNextNodep, LLLocalIDHashMap< DATA_TYPE, SIZE >::mNodes, LLLocalIDHashMap< DATA_TYPE, SIZE >::mNull, NULL, LLLocalIDHashMap< DATA_TYPE, SIZE >::removeWithShift(), S32, and TRUE. Definition at line 202 of file lllocalidhashmap.h. References count, FALSE, first, i, LLLocalIDHashNode< DATA, SIZE >::mNextNodep, LLLocalIDHashMap< DATA_TYPE, SIZE >::mNodes, LLLocalIDHashMap< DATA_TYPE, SIZE >::mNull, NULL, S32, and TRUE. Referenced by LLLocalIDHashMap< DATA_TYPE, SIZE >::~LLLocalIDHashMap(). Definition at line 691 of file lllocalidhashmap.h. Definition at line 570 of file lllocalidhashmap.h. References count, FALSE, i, MAX_ITERS, LLLocalIDHashNode< DATA, SIZE >::mCount, LLLocalIDHashNode< DATA, SIZE >::mData, LLLocalIDHashMap< DATA_TYPE, SIZE >::mIters, LLLocalIDHashNode< DATA, SIZE >::mKey, LLLocalIDHashNode< DATA, SIZE >::mNextNodep, LLLocalIDHashMap< DATA_TYPE, SIZE >::mNodes, LLLocalIDHashMap< DATA_TYPE, SIZE >::mNull, NULL, S32, and TRUE. Referenced by LLLocalIDHashMap< DATA_TYPE, SIZE >::remove(). Definition at line 363 of file lllocalidhashmap.h. Definition at line 132 of file lllocalidhashmap.h. References LLLocalIDHashMap< DATA_TYPE, SIZE >::mNull. Definition at line 116 of file lllocalidhashmap.h. Definition at line 151 of file lllocalidhashmap.h. Referenced by LLLocalIDHashMap< DATA_TYPE, SIZE >::addIter(), LLLocalIDHashMap< DATA_TYPE, SIZE >::dumpIter(), LLLocalIDHashMap< DATA_TYPE, SIZE >::remove(), LLLocalIDHashMap< DATA_TYPE, SIZE >::removeIter(), and LLLocalIDHashMap< DATA_TYPE, SIZE >::~LLLocalIDHashMap(). Definition at line 152 of file lllocalidhashmap.h. Referenced by LLLocalIDHashMap< DATA_TYPE, SIZE >::addIter(), LLLocalIDHashMap< DATA_TYPE, SIZE >::dumpIter(), LLLocalIDHashMap< DATA_TYPE, SIZE >::LLLocalIDHashMap(), LLLocalIDHashMap< DATA_TYPE, SIZE >::remove(), LLLocalIDHashMap< DATA_TYPE, SIZE >::removeIter(), LLLocalIDHashMap< DATA_TYPE, SIZE >::removeWithShift(), and LLLocalIDHashMap< DATA_TYPE, SIZE >::~LLLocalIDHashMap(). Definition at line 149 of file lllocalidhashmap.h. Referenced by LLLocalIDHashMap< DATA_TYPE, SIZE >::check(), LLLocalIDHashMap< DATA_TYPE, SIZE >::dumpBin(), LLLocalIDHashMap< DATA_TYPE, SIZE >::get(), LLLocalIDHashMap< DATA_TYPE, SIZE >::getLength(), LLLocalIDHashMap< DATA_TYPE, SIZE >::remove(), LLLocalIDHashMap< DATA_TYPE, SIZE >::removeAll(), LLLocalIDHashMap< DATA_TYPE, SIZE >::removeWithShift(), and LLLocalIDHashMap< DATA_TYPE, SIZE >::set(). Definition at line 154 of file lllocalidhashmap.h. Referenced by LLLocalIDHashMap< DATA_TYPE, SIZE >::remove(), LLLocalIDHashMap< DATA_TYPE, SIZE >::removeAll(), LLLocalIDHashMap< DATA_TYPE, SIZE >::removeWithShift(), and LLLocalIDHashMap< DATA_TYPE, SIZE >::setNull().